Remember the home Indian food lesson I had with Indian Tadka? Well in addition to their lessons (which I thoroughly recommend) in the Brighton area, you can also buy packs of spices from them too. Would make a great Christmas gift for serious foodies I think. 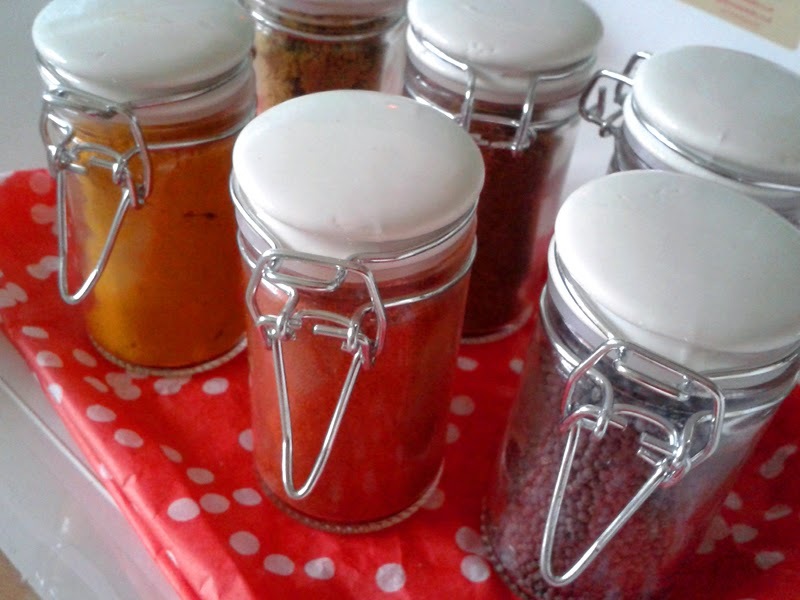 Kirthi from Indian Tadka found that her clients were always asking about the spices used in the lessons and how they could get them. Their spices are particularly special and I was amazed at how fragrant they were with so much more depth than the standard supermarket spices (which are a bit bland and dusty to me now!). They even have more vitality than the ones I normally buy from the Asian supermarkets which I thought were a step up from the supermarket jars. Their fabulous garam masala which they left with me last time is their own family blend, handed down through the generations. Seriously, the blend has really helped lift my curries and no wonder why it became in demand really. So, Kirthi's mother in India started buying spices from local Indian farmers at a fair rate to the farmer. Then the spices are all are hand blended in small batches at their family home in India before being shipped over to the UK. In my pack (which smelt unbelievable when I opened it!) there was tumeric, chilli powder, coriander powder, mustard seeds, cumin seeds and the special family recipe garam masala. All of which are really useful, basic spices for a huge number of recipes. 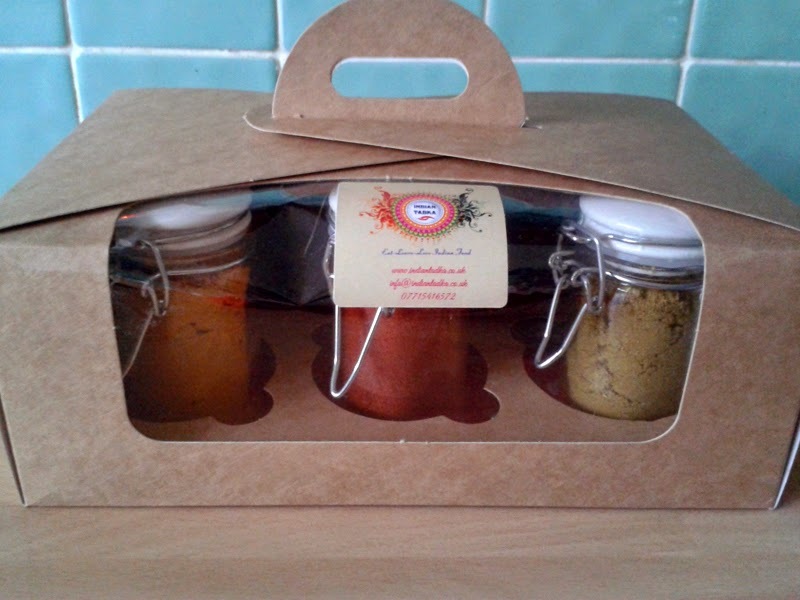 The price for the packs as shown here with 6 spices in 30g jars is £25 or you can get two sets for £40. You can order single spices, priced individually, and the cost depends on weight. Businesses (or avid curry lovers!) can order large quantities. 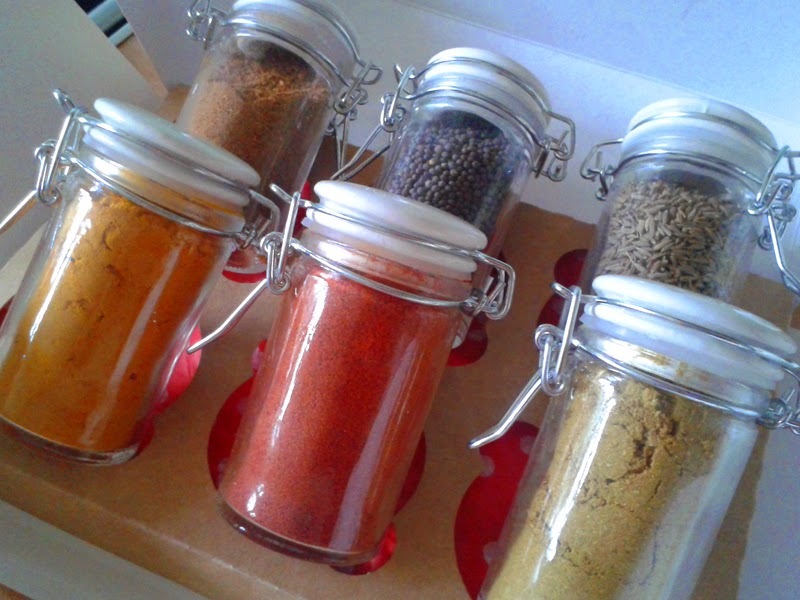 Spices can be posted for £4.80 or collect from Hove for free. The last orders for Christmas for postal orders is 14th Dec or 24th Dec for personal collection. Indian Tadka sent me one of the packs for review.